Happy Independence Day to my American readers, and belated happy Canada Day to my Canadian readers! I was curious about the national holidays of other countries, and came across this list. It looks early July is a fairly common time for Independence celebrations around the world, so best wishes to all who are celebrating. 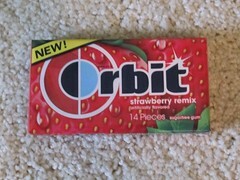 Something that always catches my eye at the grocery store is a new flavor of Orbit gum. Recently, I've seen commercials for Tropical Remix and Strawberry Remix, and since I'm such a fan of Strawberry Mint, I had to go with Strawberry Remix. The gum had a strong fruity scent, and it was strawberry-like, but with a little citrus scent. The flavor was tart, slightly sour, and had a fruity berry flavor. It wasn't terribly authentic or just strawberry, but I suppose that's the remix. Still, the gum was juicy and pretty good. The flavor was solidly fruit - no mint and no cooling sensation. The chew started out very bouncy, but it did harden as I chewed. Most of the flavor was gone in 2 or 3 minutes, and even though the leftover flavor wasn't bad, I wished the gum wasn't so short-lived.